Is The Time Right For Deep-Science Driven Entrepreneurship In India? Taslimarif Saiyed is the CEO and Director of Centre for Cellular and Molecular Platforms (C-CAMP). Entrepreneurship and innovation are key drivers of economic growth in a country. Entrepreneurs create new businesses that provide solutions for unmet needs and innovation fuels the creation of newer and more efficient solutions, technologies and products. Innovation coupled with entrepreneurship creates jobs, increases productivity and strengthens market dynamics thereby fostering economic growth. Entrepreneurship in the field of Life Sciences is blooming in India, or rather surging and it seems the weather has slowly become conducive to attempt and build some exciting innovations. Translation of scientific discoveries into products/applications requires a conducive ecosystem, where different stakeholders play a vital role in supporting young entrepreneurs (and start-ups). These stakeholders include but are not limited to: a) Funding Support, b) Academic Institutions/Clusters and c) Translation/Innovation Hubs. Early stage support for exciting, risky ideas is crucial to foster entrepreneurship. It is a delight to see that over last 4-5 years, there have been many opportunities to support early-stage ideas in life sciences. Dept. of Biotechnology, Govt. of India set up BIRAC (Biotechnology Industry Research Assistance Council), which has ignited a high number life science entrepreneurs and supported many start-ups for product development through its schemes like Biotechnology Ignition Grant (up to 50 lakhs), Biotechnology Industry Partnership Programme, Small Business Industry Research Initiative etc. Dept. of Science and Technology, Govt. of India, also has many successful initiatives to support early and late stage entrepreneurs and start-ups. In last 4 years, nearly 250 deep science-based ideas have been supported through early-stage funding schemes like BIRAC. For non-government funding, several foundations have begun to support to early-stage ideas with societal impact, like the Gates Foundation, Wellcome Trust and a few more. Recently, private funders have also built funds to support start-ups at early stage and development stage. Strong academic institutions that do cutting-edge research, have extraordinary scientific talent and high-end infrastructure often become the hotbed of early ideas getting translated into socially important products/applications. This becomes much feasible in dense scientific communities/clusters like Cambridge, Oxford, San Francisco Bay Area Boston Bay Area etc. In India too, this has become slowly possible with the creation of clusters (Bangalore Life Science Cluster, Faridabad Bio Cluster and Mohali Bio Cluster), clusters in Pune, Hyderabad, Chennai, Kolkata and others. Innovation and Translation Hubs play a crucial role in taking these ideas to the next level for development, validation and deployment. These hubs act as enablers and work in closest proximity with start-ups as an innovation hub, incubator, accelerator, or research park etc. There are some exciting hubs in India, like at the IIMs, the IITs as well as in private place like IKP, T-Hub etc. In addition, there are hubs in pure Science sector too. For example, NCL has set up a Venture Centre and C-CAMP has set up a Bio-Incubator and Accelerator. There are other bio-incubators also being set up with the help of BIRAC in many parts of the country, that will provide early support to start-ups in technical and non-technical aspects. Centre for Cellular & Molecular Platforms (C-CAMP) is a Dept. Biotechnology, Govt. of India initiative and a member of the Bangalore Life Science Cluster (BLiSC), which includes National Centre for Biological Sciences (NCBS-TIFR) and Institute for Stem Cell Biology and Regenerative Medicine (inStem). Considered one of the most successful hubs for technology-based innovation in India in the field of life sciences, C-CAMP has been an enabler of cutting-edge bioscience research and entrepreneurship since its inception. 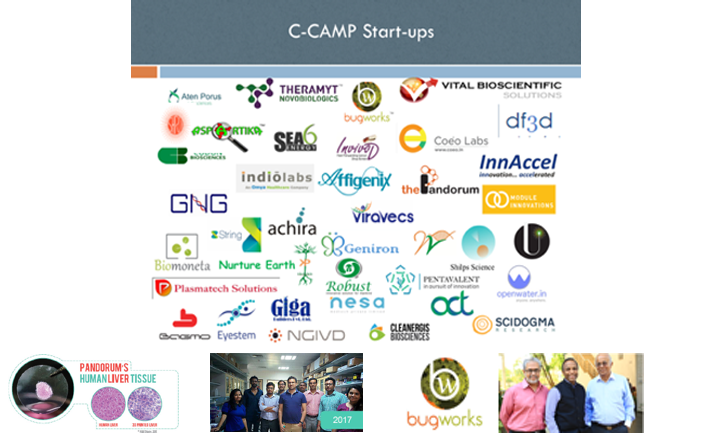 Till date, C-CAMP has supported over 90 innovative Life Science Start-ups, helping them with funding, mentorship, incubation etc. C-CAMP has seen a fair amount of success. 25 of its start-ups having secured a follow-on funding of over 200 Crores and 7 healthcare/life sciences technologies have been commercialized. In 2017, the ‘Top Innovator” Award under the Economic Times Start-up Awards was given to two startups incubated at C-CAMP. The award was a tie between Bugworks Research and Pandorum Technologies, both of which are presently incubated at C-CAMP. This is the first time the award was given to startups from the biotech field. Bugworks is a drug discovery company working in the area of Anti-microbial resistance and are developing novel antibiotics that counter the threat of resistant pathogens. Virtually all bacterial infections are becoming resistant to antibiotics, posing a fast-growing public health threat worldwide, leading to increased mortality & morbidity. Using systems biology, structural biology &medicinal chemistry, a stealth strategy has been developed to avoid efflux liability & a potentiation strategy has been designed that enables the entry of antibiotics into Gram-negative pathogens. Bugworks is the only company in Asia, recently selected under CARB-X programme from DARPA and Wellcome trust for nearly 7M USD grant. Pandorum is a biomaterials company that is working to develop 3D printed human tissues for medical research and therapeutics. Recently, they have been successful in creating artificial liver tissue. This artificial 3D liver tissue performs same functions as the human liver. Pandora has also started developing mini-organs (organoids) & bio-engineered cornea. They have received follow-on funding from Flipkart founders, Binny Bansal and Sachin Bansal. So, is the time right? Such success stories in biotech were not heard of a few years back. There weren’t many scientists building their entrepreneurial ideas and taking them to the next level. The fear of failure was still there. With significant improvement in the entrepreneurship support system, many of these things have changed. The credit for this change in mindset goes to support from different stakeholders of the ecosystem like the government, academia, industry etc. These stakeholders have shown strong desire to promote deep-science led life science entrepreneurship. There is an improved understanding at each place on how to support early-stage risky ideas and take them towards application(s). Together, the life science innovation ecosystem is taking a fantastic shape in India.Though more to be done, there is a definite hunger to support good and disruptive ideas. There can’t be a better time to make best of this supportive ecosystem and attempt to build a deep-science based enterprise that one is passionate about.